When we are not hauling my wifes Zuma 125 scooter I like to take one of my other motorcycles along. I hate using tie down straps so I added another Pitbull strapless restraint and now I can take my GSXR750 Suzuki along with my Yamaha Super Tenere. Easy load and unload for both. 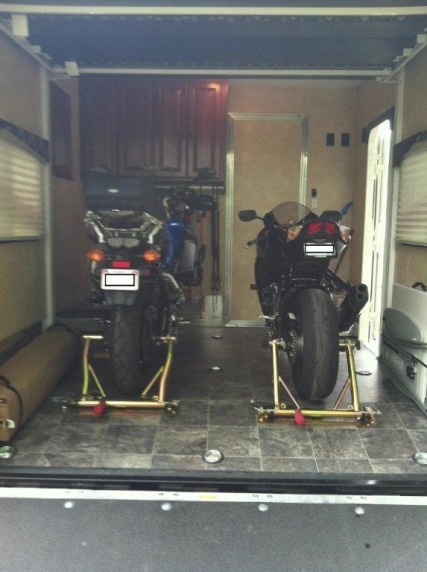 No straps frees up room between the two bikes. Easy mounting to the floor of the 276 and once they are unloaded I remove the latches and all that's left is the plates flush with the floor. I love Pitbull products which are American made in Huntsville, AL. I also use their bike stands. Are these bolted through the floor? Is the underneath of the garage easily accessible? Nice setup. I'm picking my XT276 up on Friday and trying to decide on what to do for tie downs/chocks. Yes, motorcycle chocks are easily bolted thru the floor but look underneath first to be sure where the drilled hole will come thru underneath. Also, good idea to tighten/lock tight and or double nut the factory tie downs as mine were 'snug', not tight from the factory. I don't have that style bike chock - won't work for a Harley Davidson Ultra Classic. I installed a Condor wheel chock and love it. If you shop Amazon or ebay you can get them for less too.